Mahayana Temple (Chinese: 大乘寺;; pinyin: Da Cheng Si) is a Chinese Buddhist temple located within a forest in South Cairo, N.Y.. 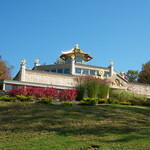 It is the retreat of the Eastern States Buddhist Temple of America, Inc. The retreat temple contain the Grand Buddha Hall, the Kuan Yin Hall, the 500 Arhat Hall, a six storied pagoda, and Earth Store Bodhisattva Hall as well as a three-unit temple dedicated to the spirits of the land. The origin of The Greek Orthodox Cathedral of Saint John the Theologian traces back to 1952, when a group of Greek Orthodox Christians were granted a charter by the Archdiocese, to establish a church in Fairview, NJ. The Ascension Church of Fairview was the only church in Bergen County at the time. According to parish history, Ascension community's membership began to grow rapidly soon after its founding. Members living in northeastern Bergen County considered establishing a new, more conveniently located church in the mid 1950's.